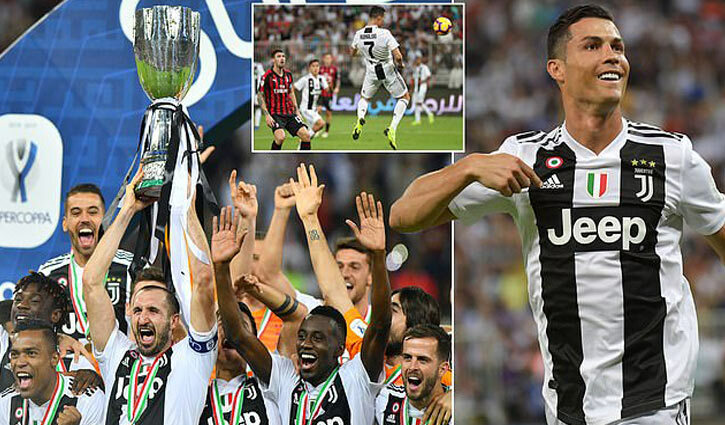 Sports Desk: Cristiano Ronaldo's header was enough for Juventus to beat AC Milan and claim a record eighth Supercoppa Italiana in a game played in Jeddah, Saudi Arabia. The Portugal forward nodded in Miralem Pjanic's lofted pass in the second half to settle a meeting between Italian football's two most successful clubs. It was Ronaldo's 16th goal of the season for the Serie A leaders. Patrick Cutrone hit the crossbar for Milan, who had Ivorian midfielder Franck Kessie sent off. Gonzalo Higuain, reportedly the subject of interest from Chelsea, was introduced as a substitute by Milan boss Gennaro Gattuso in Italy's version of the Community Shield. But the 31-year-old Argentina forward, who is currently on loan from Juventus, was unable to deliver an equalising goal for the Rossoneri, who were beaten 4-0 by Juve in the Coppa Italia final in May.